NCIS follows a fictional team of Naval Criminal Investigative Service Major Case Response Team (MCRT) special agents based at the Washington, D.C. field office in Washington Navy Yard. In real life, the field office is based at the nearby Joint Base Anacostia-Bolling while the Navy Yard is home to the museum and several military commands within the Department of the Navy. It is described by the actors and producers (on special features on DVD releases in the United States) as being distinguished by its comedic elements, ensemble acting, and character-driven plots. The NCIS is the primary law enforcement and counterintelligence arm of the United States Department of the Navy, which includes the United States Marine Corps. NCIS investigates all major criminal offenses (felonies)—for example, crimes punishable under the Uniform Code of Military Justice by confinement of more than one year—within the Department of the Navy. Whenever a crime is committed involving Navy or Marine personnel, the Washington-based Major Case Response Team — an elite arm of the Naval Criminal Investigative Service — spearheads the investigation. The team, led by laconic investigator Leroy Jethro Gibbs (Mark Harmon), has included Caitlin Todd (Sasha Alexander), Anthony DiNozzo (Michael Weatherly), Timothy McGee (Sean Murray), Ziva David (Cote de Pablo), Eleanor Bishop (Emily Wickersham), Alexandra Quinn (Jennifer Esposito), and Nicholas Torres (Wilmer Valderrama). Over the course of the series, they are further assisted by allies both foreign and domestic, including Medical Examiners Dr. Donald Mallard (David McCallum), Dr. Jimmy Palmer (Brian Dietzen), forensic specialists Abby Sciuto (Pauley Perrette) and Kasie Hines (Diona Reasonover), British intelligence officer Clayton Reeves (Duane Henry), operational psychologist and senior special agent Dr. Jacqueline Sloane (Maria Bello), and successive NCIS Directors Jennifer Shepard (Lauren Holly) and Leon Vance (Rocky Carroll). From the season-two episode "Lt. Jane Doe" onwards, the series began showing two-second-long black-and-white clips. These clips are shown at the beginning of every segment depicting the last two seconds of that segment, a segment being the five or six portions of the show meant to be separated by commercials. In the season-three premiere, "Kill Ari (Part I)", a freeze-frame shot was also used with the very end of most episodes turned into a freeze frame, as well. It was reported in May 2007 that Donald Bellisario would be stepping down from the show. Due to a disagreement with series star Mark Harmon, Bellisario's duties as showrunner/head writer were to be given to long-time show collaborators, including co-executive producer Chas. Floyd Johnson and Shane Brennan, with Bellisario retaining his title as executive producer. In fall 2009,[clarification needed] Gary Glasberg joined the crew and became the new "day-to-day" runner of NCIS, as Shane Brennan had to focus on his new show, the spin-off NCIS: Los Angeles. On September 28, 2016, Glasberg died in his sleep at the age of 50. On April 5, 2016, long-time director Dennis Smith announced he had completed his final episode as part of the NCIS crew, though to which episode he was referring was not specified. On April 11, 2019, the series was renewed for a seventeenth season. Two episodes of JAG season 8, "Ice Queen" and "Meltdown", serve as the back-door pilot of NCIS itself. 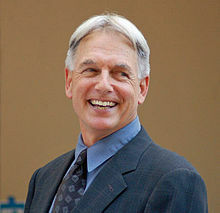 These JAG episodes introduced Mark Harmon as Gibbs, Michael Weatherly as Tony, Robyn Lively as Vivian Blackadder, Pauley Perrette as Abby, and David McCallum as Ducky. Patrick Labyorteaux appears on NCIS reprising his JAG role as Lt. Bud Roberts in the first-season episode "Hung Out to Dry", and in the fourteenth-season episode "Rogue" and the season fifteen episode "Dark Secrets"; Alicia Coppola returned as Lt. Cmdr. Faith Coleman in "UnSEALed", "Call of Silence", and "Hometown Hero", while Adam Baldwin returned as Cmdr. Michael Rainer in "A Weak Link", and John M. Jackson appeared as retired Rear Admiral A. J. Chegwidden in the season-ten episode "Damned If You Do". The two-part NCIS episode "Legend" serves as the back-door pilot of NCIS: Los Angeles. "Legend" introduces Chris O'Donnell as G. Callen, LL Cool J as Sam Hanna, Daniela Ruah as Kensi Blye, and Barrett Foa as Eric Beale. Rocky Carroll recurs on NCIS: Los Angeles as his NCIS character Director Leon Vance, while Pauley Perrette has appeared twice as Abby, and Michael Weatherly has appeared once as Anthony DiNozzo. NCIS guest stars reprising roles between series include David Dayan Fisher as CIA Officer Trent Kort, in the season-one finale of NCIS: Los Angeles; Kelly Hu as Lee Wuan Kai in NCIS: Los Angeles and later in an episode of NCIS. John M. Jackson has appeared on NCIS: Los Angeles as his JAG character Admiral A. J. Chegwidden, while this series has also crossed over with Hawaii Five-0 and Scorpion. The two-part NCIS episode "Crescent City" serves as the back-door pilot of NCIS: New Orleans. "Crescent City" introduces Scott Bakula as Dwayne Pride, Lucas Black as Christopher LaSalle, Zoe McLellan as Meredith Brody, and CCH Pounder as Loretta Wade. Rocky Carroll recurs as Director Leon Vance, while NCIS series regulars Mark Harmon, Michael Weatherly, Pauley Perrette, Sean Murray, Emily Wickersham, Wilmer Valderrama, David McCallum and Brian Dietzen have all appeared as their NCIS characters. NCIS recurring cast members Meredith Eaton, Joe Spano, Diane Neal, and Leslie Hope have all guest-starred on NCIS: New Orleans. NCIS airs on Network Ten and TV Hits (formerly TV1) in Australia, Global (syndicated on Showcase and Lifetime) in Canada, TV3 and The Box in New Zealand, Seriale+ (premieres), TVN (free-TV premieres), TVN7 (reruns), AXN (reruns) and TV Puls (reruns) in Poland, and Fox, CBS Action, Universal, Channel 5 and 5USA in the United Kingdom. The first 11 seasons of NCIS have been released in Regions 1, 2, and 4. In Germany (Region 2), seasons 1–4 and 5–8 were released in two separate sets for each season. The first-season DVD omits the two introductory episodes from season eight of JAG, though they are featured on the JAG season-eight DVD. In 2010, CBS Interactive and GameHouse released a mobile video game, NCIS: The Game for iOS, Android, BlackBerry, Windows Mobile, and BREW/J2ME. The game features five different cases written by the show's writers. On November 1, 2011, Ubisoft released a video game adaption of NCIS for the PC, Xbox 360, PlayStation 3, and Wii. A Nintendo 3DS version was released on March 6, 2012. The video game was deemed as a mockery of the show by reviewers and players alike, and received a 2/10 rating on GameSpot. There's also a Facebook and mobile game called NCIS: Hidden Crimes. Race Against Terror: Hiatus "Hiatus (Part I)" / "Hiatus (Part II)"
CBS Records released the show's first soundtrack on February 10, 2009. The Official TV Soundtrack is a two-disc, 22-track set that includes brand new songs from top artists featured prominently in upcoming episodes of the series, as well as the show's original theme by Numeriklab (available commercially for the first time) and a remix of the theme by Ministry. The set also includes songs performed by series regulars Pauley Perrette and Coté de Pablo. A sequel to the soundtrack was released on November 3, 2009. NCIS: The Official TV Soundtrack; Vol. 2 is a single-disc, 12-track set that covers songs (many previously unreleased) featured throughout the seventh season of the show, including one recording titled "Bitter and Blue" by Weatherly, as well as two songs used in previous seasons. In 2016, The New York Times reported that NCIS "is most popular in rural areas", especially in rural Maine and Pennsylvania. Seasonal rankings (based on average total viewers per episode) of NCIS. Ever since season 7, NCIS has been the most watched scripted show on American television, but it was only in the 2012–13 season that it ranked number 1 as the most watched program of the past year, surpassing both American Idol and NBC Sunday Night Football that had ranked above it the past three seasons. On January 15, 2013, NCIS surpassed its previous series high in viewers, with the season ten episode "Shiva" attracting 22.86 million viewers. The show ranked number four in DVR playback (2.714 million viewers), according to Nielsen prime DVR lift data from January 5–11, 2009. The show ranked number thirteen in DVR playback (2.743 million viewers), according to Nielsen prime DVR lift data from February 9–15, 2009. The show ranked number nine in DVR playback (3.007 million viewers), according to Nielsen prime DVR lift data from April 6–12, 2009. The show ranked number eighteen (4.793 million viewers) in the list of Nielsen ratings top twenty most-watched cable shows for the week ending January 25, 2009. The show ranked number ten (4.535 million viewers), twelve (4.264 million viewers), thirteen (4.221 million viewers), fifteen (4,161 million viewers), seventeen (4.132 million viewers), and twenty (4.081 million viewers) in the list of Nielsen ratings top twenty most-watched cable shows for the week ending March 1, 2009. The show ranked sixteen (4.091 million viewers), seventeen (4.084 million viewers), eighteen (4.072 million viewers), and twenty (4.006 million viewers) in the list of Nielsen ratings top twenty most-watched cable shows for the week ending March 29, 2009. The show ranked number five (4.492 million viewers), six (4.467 million viewers), eight (4.394 million viewers), nine (4.214 million viewers), fifteen (3.962 million viewers), and seventeen (3.8.58 million viewers) in the list of Nielsen ratings top twenty most-watched cable shows for the week ending May 3, 2009. The show ranked number three (4.82 million viewers), six (4.38 million viewers), ten (3.82 million viewers), eleven (3.88 million viewers), and fourteen (3.87 million viewers) in the list of Nielsen ratings top fifteen most-watched cable shows for the week ending November 1, 2009. NCIS has produced two spin-offs: NCIS: Los Angeles (2009–) and NCIS: New Orleans (2014–). In 2009, CBS picked up an NCIS spin-off series with the title NCIS: Los Angeles, with the backdoor pilot, "Legend", airing on April 28, 2009, and May 5, 2009. The backdoor pilot introduced Chris O'Donnell as Special Agent G. Callen, LL Cool J as Special Agent Sam Hanna, Louise Lombard as Special Agent Lara Macy, Peter Cambor as Operational Psychologist Nate Getz: and Daniela Ruah as Special Agent Kensi Blye. The crew for the series includes Michael B. Kaplan, Lev L. Spiro, Jerry London, Sheldon Epps, and Mark Saraceni. Following the show's official pick-up by CBS, it was confirmed that Louise Lombard had not been signed to continue her role as Special Agent Lara Macy. Linda Hunt and Adam Jamal Craig were confirmed to replace her in starring roles, playing OSP Manager Henrietta Lange and Special Agent Dom Vail respectively. Craig, who left the series in episode 21 of season 1, was replaced by Eric Christian Olsen playing Marty Deeks. Characters from NCIS have appeared in the spin-off. Rocky Carroll portrayed Leon Vance in a recurring role, while Pauley Perrette portrayed Abby Sciuto and appeared in the season 1 episodes "Killshot" and "Random on Purpose". NCIS: Los Angeles was created by Shane Brennan. In April 2011, NCIS creator Donald Bellisario sued CBS over NCIS: Los Angeles because of his contract which gave him "first opportunity" to develop a spin-off or sequel, the lawsuit was dismissed by a judge in June 2012. However, discussions continued between CBS and Bellisario and in January 2013 the dispute was settled outside of court a week before it was set to go to trial; the terms of the agreement were not disclosed but were described as being amicable. In September 2013 CBS announced a planned second spin-off series set in New Orleans that would be introduced via a planted two-part backdoor pilot NCIS episode. The episodes were filmed in February 2014 and aired on March 25, 2014, and April 1, 2014. NCIS star Mark Harmon and showrunner Gary Glasberg are the executive producers, and CBS Studios produces the series. "Crescent City", the two-part backdoor-pilot episode was initially "supposed to be just an idea for an episode". Glasberg discussed the idea of the episode with Harmon, who said "That's more than a[n] [...] episode". The premise for the episodes are, according to Glasberg, "all about this tiny little NCIS office that's down [in New Orleans], and the kind of cases that they come across". The series stars Scott Bakula as Special Agent Dwayne Cassius Pride, Lucas Black as Special Agent Christopher LaSalle, Zoe McLellan as Special Agent Meredith "Merri" Brody, Rob Kerkovich as Sebastian Lund, and CCH Pounder as Dr. Loretta Wade. Daryl "Chill" Mitchell, Shalita Grant and Vanessa Ferlito joined the main cast later, portraying computer specialist Patton Plame, Special Agent Sonja Percy, and Special Agent Tammy Gregorio, respectively. On May 9, 2014, NCIS: New Orleans was picked up by CBS and was renewed for a second season on January 12, 2015. NCIS and NCIS: New Orleans have had two crossovers. "Sister City"—Abby's brother is suspected of poisoning the passengers and crew of a private plane flying from New Orleans to Washington, D.C.
"Pandora's Box"—A theoretical terror playbook is stolen and put up for auction on the black market when Abby's homeland security think tank is compromised. NCIS has received many awards and nominations since it premiered on September 23, 2003, including the ALMA Awards, ASCAP Awards, BMI Film & TV Awards, Emmy Awards, and People's Choice Awards. ^ "Shows A-Z – ncis on cbs". The Futon Critic. Retrieved September 27, 2015. ^ Seidman, Robert (May 5, 2011). "'NCIS' Voted America's All-Time Favorite TV Show; 'Two and a Half Men,' 'Bones,' 'House,' Several Current Shows Rank". TV by the Numbers. Chicago: Tribune Digital Ventures. Archived from the original on May 8, 2011. Retrieved May 5, 2011. ^ a b c Patten, Dominic (May 23, 2013). "Full 2012–2013 TV Season Series Rankings". Deadline Hollywood. United States: Penske Media Corporation. Archived from the original on June 28, 2013. Retrieved May 23, 2013. ^ Andreeva, Nellie (July 18, 2018). "'NCIS': Diona Reasonover Promoted To Series Regular For Season 16". Deadline Hollywood. United States: Penske Media Corporation. Retrieved July 19, 2018. ^ Rice, Lynette (May 15, 2018). "How 'NCIS' said goodbye to Pauley Perrette". Entertainment Weekly. New York City: Meredith Corporation. Retrieved May 18, 2018. ^ Kang, Cecilia (September 24, 2014). "The power of traditional TV: 'NCIS' and its older audience deliver gold for CBS". The Washington Post. Washington, D.C.: Nash Holdings LLC. Archived from the original on January 12, 2015. Retrieved July 12, 2016. ^ Klimas, Jacqueline (September 16, 2013). "Navy Yard a base for operations, military trials and NCIS". The Washington Times. Washington, D.C.: Operations Holdings (via The Washington Times, LLC). Archived from the original on January 29, 2015. Retrieved October 31, 2014. ^ "NCIS – Locations – Washington DC field office". ncis.navy.mil. Archived from the original on July 16, 2016. Retrieved July 12, 2016. ^ "NCIS Naval Criminal Investigative Service". www.ncis.navy.mil. Retrieved 2019-02-20. ^ Carter, Bill (October 27, 2005). "Behind a Quiet Little Hit, a Reliable Hit Maker". The New York Times. Archived from the original on January 12, 2015. Retrieved June 7, 2013. ^ "Yankee White". NCIS. Season 1. Episode 1. August 23, 2003. 4:53 minutes in. ^ "'NCIS' Loses Producer". New York Post. New York City: News Corp. May 7, 2007. Archived from the original on August 19, 2014. Retrieved August 17, 2014. ^ Ausiello, Michael (May 5, 2007). "Exclusive: NCIS Boss Exits!". TV Guide. Radnor Township, Pennsylvania: NTVB Media CBS Interactive (CBS Corporation) (digital assets). Archived from the original on March 11, 2009. Retrieved February 25, 2009. ^ Pickard, Michael. "NCIS sails on". C21 Media. Archived from the original on January 12, 2015. Retrieved February 9, 2012. ^ "Dennis Smith on Twitter". Twitter. Archived from the original on June 11, 2017. Retrieved April 8, 2016. ^ Knox, David (December 18, 2013). "Seinfeld switching to TVH!TS". Australia: TV Tonight. Archived from the original on October 13, 2014. Retrieved October 7, 2014. ^ Knox, David (September 15, 2008). "Returning: NCIS". Australia: TV Tonight. Archived from the original on April 27, 2015. Retrieved October 7, 2014. ^ Knox, David (September 11, 2009). "Returning: NCIS. Airdate: NCIS: LA". Australia: TV Tonight. Archived from the original on September 27, 2015. Retrieved October 7, 2014. ^ Knox, David (October 1, 2010). "Airdate: Undercover Boss Australia. Returning: Modern Family, NCIS, Good Wife". Australia: TV Tonight. Archived from the original on May 23, 2014. Retrieved October 7, 2014. ^ Knox, David (September 18, 2011). "Returning: NCIS, NCIS: LA, Hawaii Five-0". Australia: TV Tonight. Archived from the original on July 5, 2015. Retrieved October 7, 2014. ^ Knox, David (September 24, 2012). "Returning: NCIS, NCIS: LA". Australia: TV Tonight. Archived from the original on September 27, 2015. Retrieved October 7, 2014. ^ Knox, David (October 15, 2013). "Returning: NCIS". Australia: TV Tonight. Archived from the original on October 23, 2013. Retrieved October 7, 2014. ^ Knox, David (September 13, 2014). "TEN to improve schedule with Scorpion, Gold Coast Cops, NCIS, Modern Family". Australia: TV Tonight. Archived from the original on October 6, 2014. Retrieved October 7, 2014. ^ Wagner, Alex. "CBS Interactive and GameHouse to offer NCIS mobile game and contest". Archived from the original on September 9, 2010. Retrieved September 5, 2011. ^ "NCIS Review". GameSpot. Archived from the original on December 22, 2011. Retrieved January 4, 2012. ^ "NCIS: The Movie | NCIS". Channel 5. United Kingdom: Channel 5 Broadcasting Ltd (Viacom International Media Networks Europe). Archived from the original on May 17, 2014. Retrieved June 6, 2014. ^ "NCIS | The NCIS Movie: Enemies". Radio Times. United Kingdom: Immediate Media Company. April 8, 2013. Archived from the original on October 19, 2014. Retrieved June 26, 2014. ^ "NCIS Movie: Judgement Day (Judgement Day – Parts One and Two) on Channel 5 +1, Sat 15 Feb 9:30pm – Your UK TV Listings at". TVGuide.co.uk. London. Archived from the original on September 19, 2016. Retrieved June 6, 2014. ^ "Legend Compilation | NCIS". Channel 5. United Kingdom: Channel 5 Broadcasting Ltd (Viacom International Media Networks Europe). Archived from the original on May 28, 2014. Retrieved June 6, 2014. ^ "NCIS | The NCIS Movie: Legend". Radio Times. United Kingdom: Immediate Media Company. April 8, 2013. Archived from the original on October 19, 2014. Retrieved June 26, 2014. ^ "NCIS". Radio Times. United Kingdom: Immediate Media Company. Archived from the original on December 15, 2014. Retrieved December 15, 2014. ^ "The NCIS Movie: Kill Ari". TVGuide.co.uk. London. Archived from the original on December 15, 2014. Retrieved December 15, 2014. ^ "NCIS | The NCIS Movie: War on Terror: Engaged – Parts One and Two". Radio Times. United Kingdom: Immediate Media Company. Archived from the original on March 11, 2014. Retrieved June 6, 2014. ^ "The NCIS Movie: Payback on Channel 5 +1, Sat 1 Mar 7:30pm – Your UK TV Listings at". TVGuide.co.uk. London. Archived from the original on September 19, 2016. Retrieved June 6, 2014. ^ "The NCIS Movie: Shell Shock | NCIS". Channel 5. United Kingdom: Channel 5 Broadcasting Ltd (Viacom International Media Networks Europe). Archived from the original on May 17, 2014. Retrieved June 6, 2014. ^ "Season 10 - Episode 11: Death Wish (Part I)". Channel 5. United Kingdom: Channel 5 Broadcasting Ltd (Viacom International Media Networks Europe). Archived from the original on May 17, 2014. Retrieved August 3, 2014. ^ "Season 10 - Episode 12: Death Wish (Part II)". Channel 5. United Kingdom: Channel 5 Broadcasting Ltd (Viacom International Media Networks Europe). Archived from the original on October 25, 2014. Retrieved August 3, 2014. ^ "NCIS Movie: Race Against Terror". TVGuide.co.uk. London. Archived from the original on September 19, 2016. Retrieved September 9, 2016. ^ "NCIS Movie: Race Against Terror: Hiatus". Radio Times. United Kingdom: Immediate Media Company. Archived from the original on September 19, 2016. Retrieved September 9, 2016. ^ "NCIS Music". ncismusic.com. Archived from the original on December 19, 2008. Retrieved December 16, 2008. ^ "NCIS: The Official TV Soundtrack Released Today". Numeriklab. February 10, 2009. Archived from the original on May 8, 2009. Retrieved April 11, 2009. ^ Katz, Josh (December 27, 2016). "'Duck Dynasty' vs. 'Modern Family': 50 Maps of the U.S. Cultural Divide". The New York Times. Archived from the original on March 29, 2017. ^ "I.T.R.S. Ranking Report". ABC Television Network. June 2, 2004. Archived from the original on May 21, 2008. ^ "ABC Television Network 2004–2005 Primetime Ranking Report" Archived April 21, 2012, at the Wayback Machine. (June 1, 2005). ABC Medianet. Retrieved November 6, 2007. ^ a b Gorman, Bill (June 16, 2010). "Final 2009–10 Broadcast Primetime Show Average Viewership". TV by the Numbers. Chicago: Tribune Digital Ventures. Archived from the original on October 19, 2012. Retrieved July 29, 2010. ^ Gorman, Bill (June 1, 2011). "2010–11 Season Broadcast Primetime Show Viewership Averages". TV by the Numbers. Chicago: Tribune Digital Ventures. Archived from the original on June 20, 2011. Retrieved June 1, 2011. ^ Gorman, Bill (June 1, 2011). "2010–11 Season Broadcast Primetime Show 18–49 Ratings Averages". TV by the Numbers. Chicago: Tribune Digital Ventures. Archived from the original on October 21, 2014. Retrieved October 7, 2014. ^ Gormam, Bill (May 24, 2012). "Complete List Of 2011–12 Season TV Show Viewership: 'Sunday Night Football' Tops, Followed By 'American Idol,' 'NCIS' & 'Dancing With The Stars'". TV by the Numbers. Chicago: Tribune Digital Ventures. Archived from the original on February 9, 2014. Retrieved May 25, 2012. ^ Gormam, Bill (May 24, 2012). "Complete List Of 2011–12 Season TV Show Ratings: 'Sunday Night Football' Tops, Followed By 'American Idol,' 'The Voice' & 'Modern Family'". TV by the Numbers. Chicago: Tribune Digital Ventures. Archived from the original on October 2, 2014. Retrieved October 7, 2014. ^ Deadline Team, The (May 23, 2014). "Full 2014–14 Series Rankings". Deadline Hollywood. United States: Penske Media Corporation. Archived from the original on May 25, 2014. Retrieved May 25, 2014. ^ Mitovich, Matt Webb (May 22, 2014). "Sunday Night Football, Big Bang Top Ratings for 2013–14 Season; No. 2 New Comedy Got Axed". TVLine. United States: Penske Media Corporation. Archived from the original on October 14, 2014. Retrieved October 7, 2014. ^ "Full 2014–15 Series Rankings". Deadline Hollywood. United States: Penske Media Corporation. May 22, 2015. Archived from the original on May 22, 2015. Retrieved May 22, 2015. ^ Porter, Rick (May 27, 2016). "Final same-day viewer averages for 2015–16: Football, 'NCIS' lead charts". Archived from the original on January 3, 2017. Retrieved January 2, 2017. ^ Porter, Rick (May 27, 2016). "Final adults 18–49 same-day ratings for 2015–16: NFL and 'Empire' on top". TV by the Numbers. Chicago: Tribune Digital Ventures. Archived from the original on May 30, 2016. Retrieved May 31, 2016. ^ Porter, Rick (May 26, 2017). "Final same-day viewer averages for 2016–17: 'Sunday Night Football' leads for 6th straight year". Archived from the original on June 6, 2017. Retrieved May 26, 2017. ^ Kondolojy, Amanda (January 17, 2013). "Tuesday Final Ratings: 'NCIS', 'Off Their Rockers' & 'The New Normal' Adjusted Up". TV by the Numbers. Chicago: Tribune Digital Ventures. Archived from the original on January 19, 2013. Retrieved January 17, 2013. ^ "Nielsen TV Ratings Grey's Anatomy Has Most DVR Viewers, 90210 Greatest Share Of Viewing By DVR". TV by the Numbers. Chicago: Tribune Digital Ventures. Archived from the original on March 4, 2009. Retrieved February 19, 2009. ^ Robert Seidman (March 2, 2009). "Dollhouse premiere is 28th in total DVR viewing, 8th in % viewing on DVR". TV by the Numbers. Chicago: Tribune Digital Ventures. Archived from the original on May 28, 2010. Retrieved July 12, 2016. ^ "Nielsen TV Ratings Shows Least Watched on DVRs". TV by the Numbers. Chicago: Tribune Digital Ventures. Archived from the original on May 9, 2009. Retrieved May 20, 2009. ^ "Nielsen Ratings: Top cable shows for the week ending January 25, 2009 including Obama inauguration coverage, WWE RAW, Burn Notice, Psych, SpongeBob, Back at the Barnyard, Battlestar Galactica, Kyle XY and Damages". TV by the Numbers. Chicago: Tribune Digital Ventures. Archived from the original on February 24, 2009. Retrieved February 19, 2009. ^ Robert Seidman (March 3, 2009). "WWE RAW, The Closer and President Obama lead cable viewing". TV by the Numbers. Chicago: Tribune Digital Ventures. Archived from the original on July 29, 2010. Retrieved July 12, 2016. ^ TV by the Numbers Staff (April 14, 2009). "Nielsen Weekly most watched cable shows and other cable favorites including SpongeBob, WWE RAW, NCIS, Jon & Kate Plus 8, Secret Life The American Teenager, Pardon the Interruption, Damages, Saving Grace, Dog The Bounty Hunter, Important Things, South Park, and That's So Raven". TV by the Numbers. Chicago: Tribune Digital Ventures. Archived from the original on August 16, 2011. Retrieved April 11, 2009. ^ "Bulls vs. Celtics, WWE RAW and NCIS lead cable shows". TV by the Numbers. Chicago: Tribune Digital Ventures. Archived from the original on May 9, 2009. Retrieved May 20, 2009. ^ Associated Press Staff. "List of top 15 cable shows in Nielsen ratings". Associated Press. New York City. Archived from the original on November 16, 2009. Retrieved November 5, 2009. ^ Goodwin, Jennifer (May 20, 2009). "CBS News: Medium Saved; NCIS Spinoff Ordered". E! Online. Los Angeles: E!. Archived from the original on September 18, 2016. Retrieved July 13, 2016. ^ a b Brian Ford Sullivan (March 19, 2009). "The Futon's first look: "NCIS: Legend". The Futon Critic. United States: Futon Media. Retrieved March 21, 2009. ^ Bierly, Mandi (February 25, 2009). "'NCIS' spinoff officially lands LL Cool J". Entertainment Weekly. New York City: Time Inc. Archived from the original on March 1, 2009. Retrieved February 25, 2009. ^ Ausiello, Michael (December 12, 2008). "Exclusive: Fresh 'NCIS' spin-off intel". Entertainment Weekly. New York City: Time Inc. Retrieved December 12, 2008. ^ "CBS Press Release for NCIS episode "Legend"". The Futon Critic. United States: Futon Media. April 7, 2009. Archived from the original on January 12, 2015. Retrieved April 8, 2009. ^ "Mark Saraceni". Imdb.com. Archived from the original on May 5, 2009. Retrieved February 19, 2009. ^ "Eric Christian Olsen Promoted to Series Regular on NCIS: Los Angeles – Today's News: Our Take". TVGuide.com. July 27, 2010. Archived from the original on October 23, 2011. Retrieved October 30, 2011. ^ a b "(#103) "Killshot"". The Futon Critic. United States: Futon Media. Archived from the original on January 12, 2015. Retrieved March 1, 2015. ^ a b "(#109) "Random on Purpose"". The Futon Critic. United States: Futon Media. Archived from the original on January 12, 2015. Retrieved March 1, 2015. ^ Andreeva, Nellie (April 28, 2011). "'NCIS' Creator Don Bellisario Sues CBS Over 'NCIS: LA', CBS Dismisses His Claims". Deadline Hollywood. United States: Penske Media Corporation. Archived from the original on November 18, 2012. Retrieved November 12, 2012. ^ Patten, Dominic (June 21, 2012). "CBS Wins Court's Favor Again In 'NCIS' Creator Suit". Deadline Hollywood. United States: Penske Media Corporation. Archived from the original on June 27, 2012. Retrieved November 12, 2012. ^ "CBS Settles Lawsuit With 'NCIS' Creator (Exclusive)". Hollywoodreporter.com. January 18, 2013. Archived from the original on January 22, 2013. Retrieved March 10, 2013. ^ Patten, Dominic. "UPDATE: 'NCIS' Creator "Gratified" To Reach Settlement With CBS". Deadline Hollywood. United States: Penske Media Corporation. Archived from the original on March 4, 2013. Retrieved March 10, 2013. ^ Kenneally, Tim. "CBS and 'NCIS' Creator Settle Lawsuit Over 'NCIS: L.A.'". TheWrap. Santa Monica, California: The Wrap News Inc. Archived from the original on March 8, 2013. Retrieved March 10, 2013. ^ ANDREEVA, NELLIE (September 23, 2013). "CBS Prepping Planted 'NCIS' Spinoff Produced By Mark Harmon & Gary Glasberg". Deadline Hollywood. United States: Penske Media Corporation. Archived from the original on September 27, 2013. Retrieved September 28, 2013. ^ Willman, Chris (October 8, 2013). "Exclusive: Mark Harmon on the Next NCIS Spinoff". TV Guide. Radnor Township, Pennsylvania: NTVB Media CBS Interactive (CBS Corporation) (digital assets). Archived from the original on October 8, 2013. Retrieved October 9, 2013. ^ Halterman, Jim (October 8, 2013). "NCIS Spoilers: Gary Glasberg on Life Post-Ziva, Gibbs' Journey, Spinoff & More". TV Fanatic. Archived from the original on October 8, 2013. Retrieved October 9, 2013. ^ Hibberd, James (February 3, 2014). "'NCIS' scoop: Scott Bakula to star in new spinoff". Archived from the original on February 3, 2014. Retrieved February 3, 2014. ^ Mitovich, Matt (February 3, 2014). "Scoop: NCIS: New Orleans Pilot Adds Sons of Anarchy's CCH Pounder, JAG Alum". Archived from the original on February 4, 2014. Retrieved February 3, 2014. ^ Andreeva, Nellie (February 10, 2014). "Lucas Black Joins CBS' 'NCIS' Spinoff". Deadline Hollywood. United States: Penske Media Corporation. Archived from the original on February 14, 2014. Retrieved February 10, 2014. ^ Swift, Andy (May 9, 2014). "CBS Fall 2014 Series Orders — NCIS: New Orleans, The Odd Couple, More". TVLine. United States: Penske Media Corporation. Archived from the original on August 1, 2014. Retrieved August 5, 2014. ^ "CBS Renews Madam Secretary, Scorpion, NCIS: New Orleans". Yahoo TV. Sunnyvale, California: Yahoo. January 12, 2015. Archived from the original on January 12, 2015. Wikimedia Commons has media related to NCIS (TV series). This page was last edited on 17 April 2019, at 03:41 (UTC).